Reproductions better than the original! Many old buildings and homes are missing the fanciful etched glass door and windows that were part of the original decor. 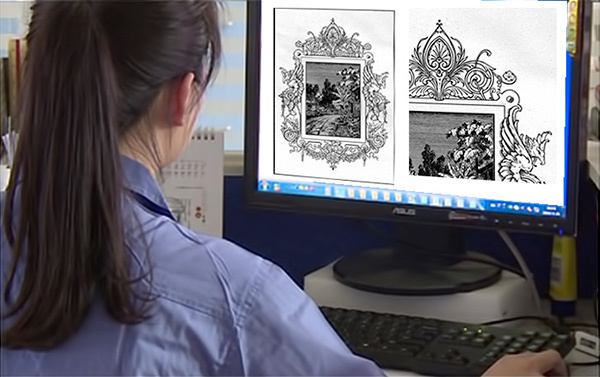 Now that period look can be restored with better quality imaging techniques and the improved safety of modern glass. The fact that our designs have been converted to computerized vector-based (CAD) files gives us the ability to adjust the size of the design to fit most any opening. We can also mix and match the elements of the design to suit the style of the customer. For example, if you like the border of one design as shown on our patterns page but would prefer the center part from another, we can easily recombine the parts to create what you visualize. Our Proprietary Stencil System Produces Sharp, Accurate Artwork on the Glass. First the design is adjusted for perfect fit to the opening dimensions using our vector-based layout software. A stencil masking the negative areas is applied to the surface of the glass. The stencil protects the areas of the design where the glass will remain clear during sandblasting. 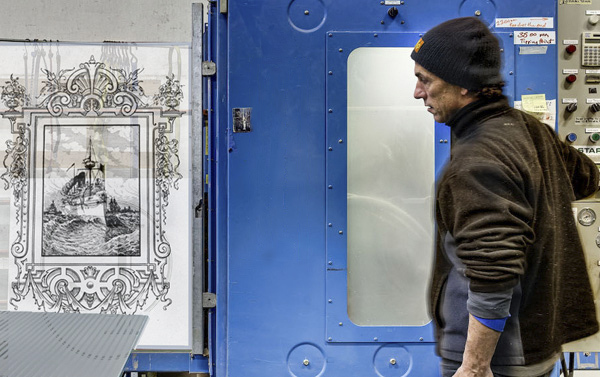 The finished panel emerges from the automated sandblast machine—an accurate reproduction of antique sandblast etched glass.